Outer space is much too close. Or rather (since space extends everywhere), its furniture, its stage props are. Past a great spinning wheel, the technological purpose of which is hard to fathom—it looks partly like a state-of-the-art waterwheel ferrying, ensconced in each of its compartments, a sphere of some kind (a planetoid, perhaps? ), partly like an arcing array of electronic circuits—rough-hewn asteroids hurtle by. They are so near that the imagination boggles at why gravity doesn’t bring them crashing in. Or, perhaps, it will? That seems unlikely, however: down on the glistening terrace of a municipal building designed in retro style (it rather recalls Earth visions of modernist architecture from the 1950s or ‘60s, and we’re in the future, aren’t we?) the inhabitants of the city stroll about unconcerned. Off the wheel a conduit emerges, shaped like the graph of a square-waved function, here ending in a hexagon reminiscent of a child’s wire bubble-blower, there curving out then swooping back down, four discs attached to it looking rather like traffic signs for flying cars. Behind it, a great tower, the form of a decanter neck, reaches out of our field of vision. The wheel may be attached to it—perhaps by means of the tilted beam that crosses it not quite diametrically, its surface inflected with panes or perhaps cables trailing an intricate design of shadows—or may not be. Oddly, the shadow the wheel projects onto the tower doesn’t correspond in the least to the wheel’s shape. Behind the tower, a glass cupola; above the cupola but below the swarm of asteroids, an explosion. Or so it seems. Bright light emanating, beams spreading out: again, why is no one taking heed? Is this a daily, an hourly occurrence? Is that explosion, perhaps, permanent, frozen in time? Straight before us, overlapping the cupola, stands the strangest structure of all. It rises into space in a zig-zag of sharp-edged, reflective facets, some jutting out as ledges (though, again, the shadows beneath them, if that is what the dark areas are, have no connection to the shapes that cast them), some forming ramps; convexities abut concavities to fashion a three-dimensional labyrinth that seems to have no inside, or rather that is inside and outside at once. To the right of it, past a cat’s cradle of conduits, concatenated pods, and a vertical tube that conducts some sort of energy, lies again open space. Yet this portion of the cosmos bears little relation to its counterpart on the left. No asteroids here (so maybe they are not moving sideways, despite their apparent trails, but toward us? Or perhaps they themselves are frozen in space?). Space here seems to be made of shimmering plasma, before which float entire planetary systems, their orbs grotesquely impinging on one another. From behind the zig-zag structure rises what may be a shuttle, or is that the spire of an astronautical church? In front of it, on the right, squats an oval armadillo’s shell of a building, covered in plates or scales. Is it an auditorium? A sports arena? The lower parts of the view seem more inviting to human habitation. Another domed structure in the foreground could almost be a private penthouse: we see its atrium leading, like a funnel, to an inviting inner door. It stands atop an assemblage of volumes, each of which individually makes geometrical sense; the whole, however, tends toward irrationality, futuristic urbanism apparently having taken its cues from modern sculpture at its most chaotic. We can see into the depths of the city, many gleaming glass, steel, and polymer levels down. The city is composed of masses, supports, and open spaces articulated together, of shadows and reflections, of conduits and gaps. On the glistening terrace, people are strolling, or perhaps standing. It’s hard to tell. They look so tiny, so far away. The question remains: why are they not worried about, or even notice, the looming asteroids, the infestation of planets and moons, the frozen explosion and the space plasma? How are they protected from these celestial threats? Does the entire city itself lie under a transparent dome? Or, given the disjunction of the two cosmic windows, on the right and the left, are those views only projections, gigantesque video monitors, hallucinations, ghostly apparitions? One human is closer to us than the rest. He (if it’s a he) has wings. He’s soaring from the terrace toward us. To warn us or greet us? Maybe, if he ever got here, we could ask him how this all makes sense. Of course it doesn’t make sense; it doesn’t need to. This is a drawing. It’s a science-fictional cityscape rendered in graphite on paper, coal on the pressed pulp of trees, barely processed products of nature giving birth to futuristic dreams. The drawing is constructed of rhythms of black and white, or rather of graphite gray and the cream-yellow of the acidified Bristol board. The graphite is applied with no blending at all, so there are no areas of graduated shades: a mark is either present or absent. “Greys,” intermediaries between black and white (between presence and absence) are obtained through closer or more spread-out hatching. There are differences in mark-making between simple lines that stand for edges or grooves, hatching lines, the concentric feathering of the explosion, areas fully filled in (though, even there, we can see the directions of the pencil strokes), and the twirled motions used to render the ovals in the plasma-like portion of the sky. On the left side of the drawing, below the halfway point, where the wheel crosses in front of the decanter-neck tower, its curved-edged “shadow,” when considered closely, recalls the markings on a Holstein cow. The first two compartments on the lower part of the wheel, coming in from the edge, most resemble window blinds complete with the string used to open and close them, the ones in the left-most compartment part-way open (we can tell by the triangles that mark the end of each division), the ones in the next one over fully closed. Not only is this vision of the future born of paper and graphite; it is also concocted of humbler, everyday visual impressions: household objects, the hides of farm animals. The drawing, made by Jack Kirby in 1966, invites comparison on this account to others of his works—namely, the collages he started producing at the time, where space machinery was aggregated from the pasted-together fragments of consumer objects in magazine ads: air conditioners, family station wagons, television sets. If one extends this reading to the entire image, one can find other components of Kirby’s visual imagination. Some of them we have named already: armadillo shell, decanter, bubble-blower, boulders, traffic signs. The piston-like architectural element in the low foreground could be a car-engine fuse. Some of the abstract designs of mysterious “Kirbytech” come from pre-printed circuit boards. We tend to think of drawing and collage as two different aspects of Kirby’s practice during the ‘sixties, but on closer inspection, they follow the same logic. Rhythms of black and white: the most complex product of this graphic impulse, whereby abstraction brings illusionistic objects into being, is the zigzag shape in the top center. I doubt that we could resolve into Euclidian three-dimensional geometry its upper end, what we might call its “head” and its “beak.” Leaving aside the vertical marks that connect it to the top edge of the drawing, the structure begins with a polygonal surface that appears reflective (as suggested, at least, by several fascia of hatching lines). Is the loosely trapezoidal black area beneath it a shadow cast onto the next-lower white surface? This seems unlikely, given the geometry at the structure’s left corner, which suggests the simple ending face of a block. Is the object constructed by the top surface and the one (or two) right underneath it convex or concave? The answer is undecidable at best. The same questions can be raised about the two or three planes right underneath the “beak,” which feature what might again be called “Holstein” shadows. Indeed, such issues arise at every corner, every junction of the building; there is something of M.C. Escher about it, though it’s doubtful that Kirby constructed it intentionally as a visual puzzle: even its paradoxes are not clear-cut enough for that. 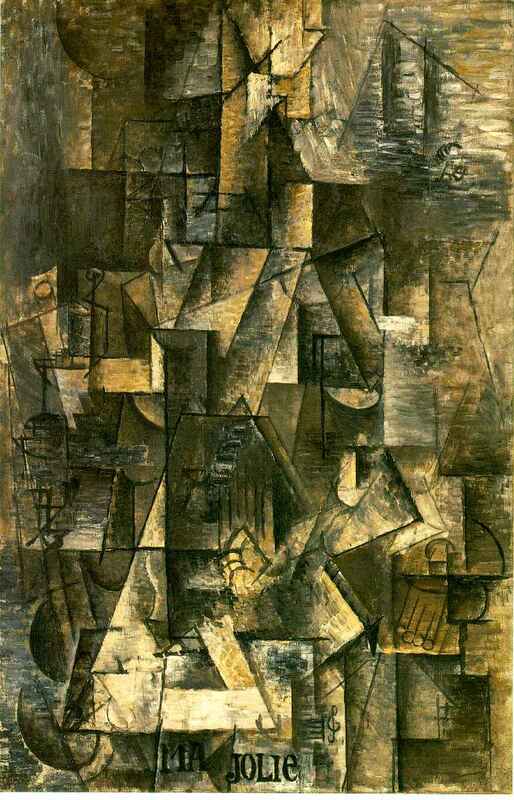 A closer comparandum is offered by the construction in facets of Analytic Cubism, for example in Pablo Picasso’s early 1912 Ma Jolie. There, localized visual signs (shading, edges) point toward three-dimensionality, yet the facets are never allowed to cohere into a unified, rational three-dimensional shape. Kirby’s procedure is parallel to that of Cubism but runs in the opposite direction: upon a first impression, the three-dimensional object seems to make sense, yet, upon closer inspection, it breaks down into its own incoherent facets. The central, “beaked” structure also constitutes the area of the painting for which the notion of “rhythm” is least metaphorical: rising up in zigzag, its ramps and parapets overlapping and interpenetrating each other, it forms something akin to a musical score along which the areas of black and white are arrayed, always two or more rows of them moving alongside each other in counterpoint, while the structure’s individual segments, like musical phrases, turn right then left then right again: the entire building is a graphic fugue. The Futuristic Cityscape, like many others of Kirby’s visions, is also a collage, that is to say an accumulation of motifs, on a more macro scale. Many of its constitutive elements echo those in earlier depictions of science-fictional metropolises in comics and, especially, on the covers of pulp magazines—none so much as Frank R. Paul’s multiple depictions of similar subjects. Yet, while Paul’s spaces are still rational—they can be plotted, mapped; there is plenty of breathing room between his edifices—Kirby’s is not. This is not to say that it could not be constructed, but that there is an excess of volume and matter there, that no sane architect would construct buildings like this; that, in terms of engineering, of city planning, the individual edifices and their interrelationships make no sense. The drawing reminds me most, from this point of view, neither of Paul nor of other pulp covers or comic-book splashes, but rather of the work of visionary architects (and especially visionary architects on paper, imagining edifices unbuildable in real life) of the eighteenth century. At first we can see its accumulation of space-age motifs as akin to that in an architectural capriccio by Giovanni Paolo Panini—an artist who would, often for the benefit of English nobility heading back home from their Grand Tour, juxtapose in a single painting the principal monuments of Rome, in spatial relationships unrelated to their respective placements in real life, and so close together that the paintings begin looking like picturesque monument dumps, leaving only narrow passageways between, say, the Arch of Constantine, the Column of Trajan, and the Coliseum. 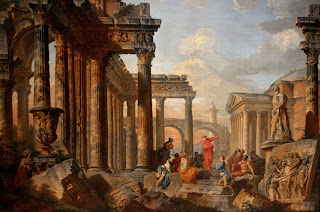 All such capriccios were organized according to a common theme: if Pannini’s was ancient Rome, we can easily see Kirby’s being science fiction, and we can conceive of Kirby himself as the foremost of the capriccio vedutisti of the space age. While the logic of aggregation in Kirby is close to Pannini’s, the sublime vision in his work is closer to that of Giovanni Battista Piranesi. 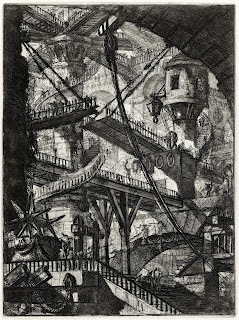 I’m thinking particularly of Piranesi’s imaginary Prisons etchings, and, within those, of plate VII, in the darker, more detailed second state of 1760. Many years ago, when I was looking over Piranesi's Antiquities of Rome, Mr. Coleridge, who was standing by, described to me a set of plates by that artist, called his Dreams, and which record the scenery of his own visions during the delirium of a fever. 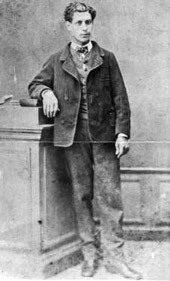 Some of them (I describe only from memory of Mr. Coleridge's account) represented vast Gothic halls: on the floor of which stood all sorts of engines and machinery, wheels, cables, pulleys, levers, catapults, &c.&c. expressive of enormous power put forth and resistance overcome. Creeping his way upwards, was Piranesi himself: follow the stairs a little further, and you perceive it come to a sudden abrupt termination, without any balustrade, and allowing no step onwards to him who had reached the extremity, except into the depths below. Whatever is to become of poor Piranesi, you suppose, at least, that his labours must in some way terminate here. But raise your eyes, and behold a second flight of stairs still higher: on which again Piranesi is perceived, by this time standing on the very brink of the abyss. Again elevate your eye, and a still more aerial flight of stairs is beheld: and again is poor Piranesi busy on his aspiring labours: and so on, until the unfinished stairs and Piranesi both are lost in the upper gloom of the hall. The Futuristic Cityscape is Kirby’s vision of the same “wilderness of building,” projected at a cosmic scale. It is constructed of “blazing” (what better way to describe the stationary explosion?) “terrace upon terrace,” of “alabaster domes” or rather glass cupolas, and of “silver spires” that rise into the “splendour” and “boundless depth” of outer space. The Futuristic Cityscape is Romantic and modern at once; it bears comparison, on one hand, to Pollock and Picasso, and to collage work such as that of Hannah Höch or John Heartfield, not to mention Robert Rauschenberg; on the other to Panini, Piranesi, and the sublime conceptions of Coleridge and Wordsworth. One might take this double allegiance as an emblem for superhero, or more generally for science-fiction comics as a whole: created in the middle years of the twentieth century, in America, with its booming technology and abstract painting, yet continuing, dressing them up in space-age accoutrements, the epic fantasies of the Romantic period. Never were both strands—the Romantic and the modern—so emphasized and crisply delineated, so brought into conflict but also so skillfully intertwined, as in Kirby’s work, particularly after 1965 or so. From this perspective, the Futuristic Cityscape can be read as a synecdoche for Kirby’s late period as a whole, and as an ideal stepping stone for deciphering the cosmic vision inherent in his comics. 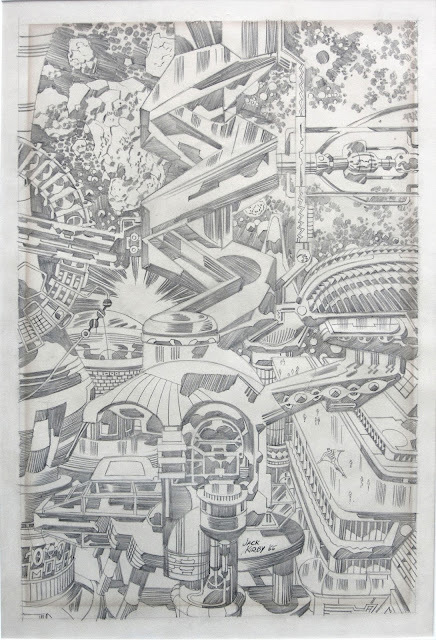 The drawing, one of two made by Kirby for Don Heck, has come to us under the faute de mieux title of Futuristic Cityscape. Heck acquired the two drawings as payment from Kirby for inking some drawings for him: “I talked him into doing me a couple of pages, which I still have. I told him, ‘The money, I’ll go through.’ [laughs] But I have these two original pages that Jack did just for me that were never printed. One was a big city, and the other was like a big robot-type character. It turned out pretty good. Like I say, it was done in 1966.” John Coates, Don Heck: A Work of Art (Raleigh, NC: TwoMorrows, 2014), 30-31. De Quincey, Confessions of an English Opium Eater and Other Writings (Harmondsworth: Penguin, 2003), 78. Permanent publication without a price. All content copyright the individual contributors.